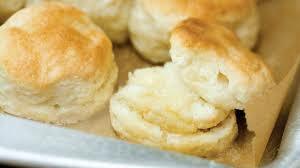 I'm never opposed to time savers in the kitchen and I think Pillsbury has done a pretty darn good job with their frozen Southern Style Biscuits, but.... there is nothing like a homemade buttermilk biscuits with it's flaky layers and buttery goodness. They are so much easier to make then most people think and the payoff is worth it. This recipe is super simple to whip together in no time, add a little country ham and orange pecan butter, and you are in the brunch business. Preheat oven to 475. Using a grater, grate the frozen butter using the large hole section. Toss the butter and flour together in a medium bowl. Place the bowl in the fridge for 10 minutes. Make a well in the center of the flour mixture. Add the buttermilk, stir 15 times or until combined. The dough will be sticky, if it is super dry, add just a bit more buttermilk. Place dough on lightly floured surface. Sprinkle flour onto dough and onto rolling pin. Roll dough to a 3/4" thick rectangle about 9x5. Fold the dough in half with the short ends. Roll again and repeat this step four times, rolling and folding. On the final roll, roll into a 1/2" thickness and cut with a sharp biscuit cutter that has been floured. It's okay to reshape and reuse the scraps. Be sure to use a sharp biscuit cutter, and don't twist it. Place biscuits on parchment paper lined pan, bake for 15 or until lightly browned. Brush withe melted butter and serve immediately. Mix all ingredients together and serve aside warm buttermilk biscuits.